Leading Importer of softy ice cream machine, softy ice machine, softy making machine, softy premix powder and softy cone making machine from New Delhi. 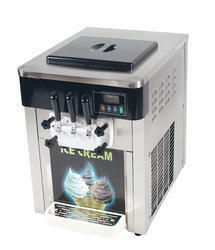 Single compressor softy ice cream machine. 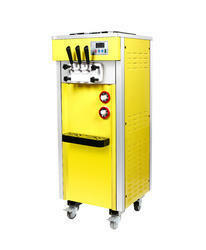 Softy Ice Cream machine Floor model with caster wheels, Pre cool Model with 2 compressors. The plate body is made of food grate stainless steel and colorful spraying steel, elegant appearance and sanitar. Micro-computer controlled system with the temperature digitally shown, regulate the hardness at any time. Highly efficient & fast-cooling evaporator, cooling faster, low-temperature effect is excellent. 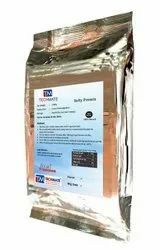 We are supplying good quality softy premix powder all over India. It is ideal for all the softy ice cream machine to make Creamy, Smoother and rich texture soft ice cream. It comes in aluminum foil bags with moisture-proof vacuum Packing. Ready to use and ideal to make high-quality soft ice cream. Delicious taste and long shelf life. Rich in protein, calcium & Other nutrition. How to use softy mix? Mix Full cream milk with softy Premix. Blend it well with the hand whisk or commercial blender to get a perfect and smooth mixture. Let the mixture rest for 30 mins to get perfect results. Now, pour this mixture in the hopper of the machine and start the machine.